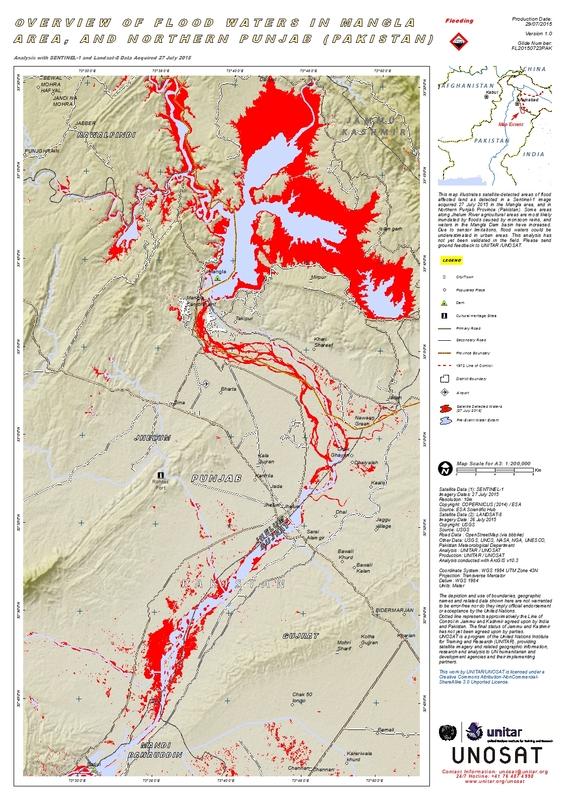 This map illustrates satellite-detected areas of flood affected land as detected in a Sentinel-1 image acquired 27 July 2015 in the Mangla area, and in Northern Punjab Province (Pakistan). Some areas along Jhelum River agricultural areas are most likely inundated by floods caused by monsoon rains, and waters in the Mangla Dam basin have increased. Due to sensor limitations, flood waters could be underestimated in urban areas. This analysis has not yet been validated in the field. Please send ground feedback to UNITAR /UNOSAT.